We understand that in this fast-paced world, you need to have access to your investment accounts whenever it’s most convenient for you. Access Online lets you do just that, with new features and functionality to help serve you better on any device. Up-to-date, detailed information about your accounts, the latest news and research reports, commentaries on current market and economic events, and much more are available for viewing 24 hours a day, 7 days a week. * You’ll also have the comfort of working with your Wealth Advisor to help you reach your financial goals. If you like to stay on top of your portfolio, our website provides you with great tools to help monitor your investments. The Brokerage Overview allows you to access all of your account information in one place. 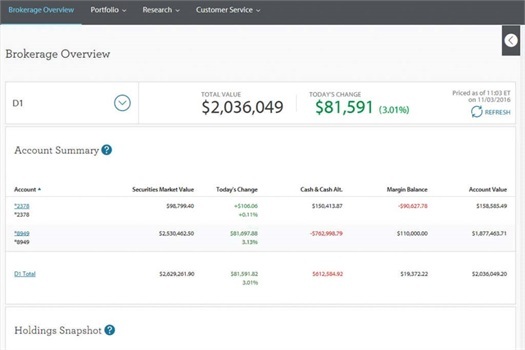 Review your account summary, holdings, allocation, performance and more on one consolidated page. View real-time account information for your individual accounts, or for your entire household. Download your account information to Quicken® or Microsoft® Excel. Enjoy the convenience of electronic delivery of statements, trade confirmations, and/or shareholder communications. You can change and customize your document delivery preferences at any time. Securely access new account documents as soon as they are created. Obtain real-time quotes, news, interactive charts, company profiles, ratings, and research reports to help you select securities for your portfolio. Set up Market Alerts to be sent to any device with an e-mail address (i.e., desktop, smartphone or tablet). You can receive alerts for individual securities, entire portfolios, or specific industries. Launch Portfolio Tracker to get 15-minute delayed streaming quotes, news, and charts on your desktop. 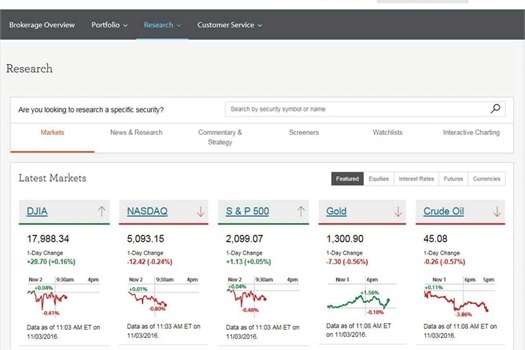 Receive updates throughout the day on market indexes, securities, and breaking news on your portfolio, even after logging off of Access Online. Enrolling your account(s) for Access Online is easy. You can initiate the enrollment process from the Hilliard Lyons Access Online login screen and follow the instructions below. * During times of high volume of trading at the market opening, or intra-day, clients may experience delays in system access, or execution at prices significantly away from the market price quoted or displayed at the time the order was entered. Investment and Insurance Products: Account(s) carried by First Clearing. First Clearing is a trade name used by Wells Fargo Clearing Services, LLC, Member SIPC, a registered broker-dealer and non-bank affiliate of Wells Fargo & Company. NOT FDIC Insured | NO Bank Guarantee | MAY Lose Value. © 2012, 2015-2018 Wells Fargo Clearing Services, LLC. All rights reserved. For enrollment assistance, please contact Access Online Support at 1-877-488-3748, available 24 hours a day, 7 days a week. If you do not know your account number, contact your Wealth Advisor. For online security and account protection purposes, you will be asked multiple questions to verify your identity. Once all questions are answered correctly, please hit the “Next” button. If you answered incorrectly and cannot get access, call the Client Services Center (open 24/7) at 1-877-488-3748 to establish access. If you have more accounts you want to view online, add each account number individually on this screen. To add an account, enter your 8-digit account number in the field, and hit the “Add account” button. If you do not know your account number, contact your Wealth Advisor. Once all your account numbers have been entered, or if you have no additional accounts to add, click on the “Create UserID/Password” button to continue. If you receive an error message that an “account number you entered is not eligible for association with your UserID” when trying to link an account to your online access, call the Client Services Center at 1-877-488-3748. You will be asked to create three security questions. You can pick a question from the dropdown list or create your own question by clicking the link. Please note: all answers must be at least four characters (including spaces) and no two answers can match. Answers are not case-sensitive.